One of the most popular, arguably the most popular, player on the women's LPGA golf tour is Lexi Thompson. Here is a list of all the companies and products that sponsor Lexi Thompson in 2019. At the young age of 23, Lexi Thompson has already won nine times on the LPGA Tour including winning one women's golf major. 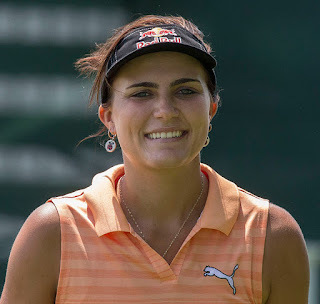 Lexi Thompson has also won a tournament on the Ladies European Tour (Dubai Ladies Masters in 2011) and a tournament on the LPGA of Japan Tour (World Ladies Championship Salonpas Cup in 2016). Lexi Thompson has parlayed all that success on the golf course into a ton of very lucrative endorsement deals as outlined below. On a yearly basis Lexi Thompson earns at least $5 million a year from the endorsements she has with the sponsors below. Lexi Thompson signed an endorsement deal in late 2017 with Bridgestone Golf. As part of the deal she now plays with a Bridgestone Tour X B golf ball. Lexi claims she has been using Bridgestone golf balls for many years and now she's been paid to play with those balls. Energy drink maker Red Bull has been sponsoring Lexi Thompson since 2010. Lexi wears a visor with Red Bull on it during tournaments and in 2017 she shot a underwater ad to promote the product. Lexi Thompson has been promoting Cobra-Puma golf since she was 15 years old. She exclusively uses Cobra clubs and can be often seen on social media wearing clothes with the famous puma label. The puma label also appears on the shirts she wears during events. Cobra-Puma considers Lexi equal to their main male golfer Rickie Fowler for brand awareness. Lexi Thompson has been the female brand ambassador for the Zurich Insurance company since 2015. She wears the companies logo on the left sleeve of the golf shirts she wears in tournaments. Rolex is the official sponsor of the Rolex Women's World Golf Rankings and the luxury watch maker also sponsors Lexi Thompson. Rolex loves when Lexi wins a tournament because when she holds up the winning trophy for photos that will be seen around the world everyone can see the Rolex watch on Lexi's wrist. Luxury car maker Lexus began sponsoring Lexi Thompson in 2016. She has posed many times with souped up Lexus cars and posted them on her social media accounts. Not sure if Lexus has dropped her, though, as Lexi does not appear on the latest list of sponsored athletes on the Lexus website. Lexi Thompson partners with the LPGA on behalf of various military support groups. In May of 2017, Lexi joined with a Navy Seal to parachute down to the first tee at the Kingsmill Championship to support the SEAL Legacy Foundation. After hitting the ground Lexi went to the first tee and started her round of golf for the pro-am tournament. Lexi Thompson lists Smuckers as one of her sponsors but this author is unable to find any more about it. Seems like a sticky situation here.